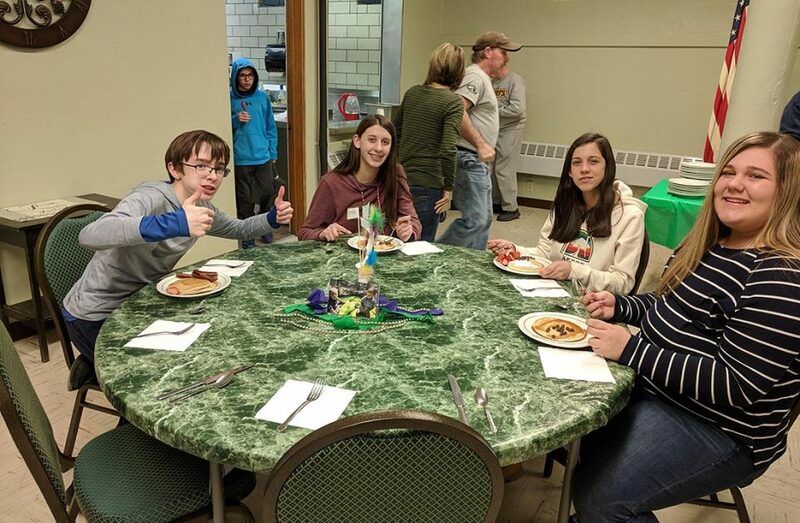 In anticipation of a Lenten challenge, confirmation youth at Trinity Lutheran Church in Connellsville, Pa., used washable plates and utensils rather than plastic for their Shrove Tuesday dinner. From left to right: Edward Stephenson, Abby Tikey, Emma Tikey and Madison Wadsworth. Lent is a time of spiritual reflection and preparation for the coming of Christ. Many Christians will choose to give up something or take up a Lenten discipline. But for dozens of congregations in the Southwestern Pennsylvania Synod, this Lent is a time for action. Responding to God’s call to care for creation, they’re limiting their consumption of single-use plastic. Sarah Rossing, pastor of St. James Evangelical Lutheran Church in Youngstown, Pa., and chair of the synod’s church and society committee, issued the synod-wide Lenten challenge. “This is a way we can act from our values and conviction that God is the creator of everything,” she said. During each week of Lent, synod members will forgo different plastic items—including shopping bags, straws, water bottles and food wrappers—that endanger wildlife, clog landfills and pollute the ocean. For Amy Santoriello, deacon and director of faith formation and outreach at Zion Lutheran Church in Penn Hills, Pa., the Lenten challenge is a way to protect the earth from the “scourge” of plastics. “It’s prompted me to finally put reusable utensils in my purse,” Santoriello said. She feels inspired by youth who discourage use of plastic water bottles and straws. The challenge has also prompted congregation-wide changes. Members are reusing plastic bags in their congregation’s food pantry and distributed reusable plates and flatware instead of plastic at a recent youth dinner. To call plastic’s effect on the earth a scourge is no exaggeration. It is estimated that more than 300 million tons of plastic are produced each year, and that up to 91 percent of it is never recycled. Plastics don’t biodegrade and may remain in landfills for hundreds of years. CNN recently reported that a young whale that washed up on a beach in the Philippines had died of starvation and dehydration after consuming 88 pounds of plastic bags. “The amount of plastic that Americans throw out and that ends up in a landfill or the oceans is sickening,” Santoriello added. Santoriello said that limiting single-use plastic for Lent is a way for ELCA members and congregations to contribute to creation care, an ELCA teaching grounded in the biblical vision of God’s intention for the healing and wholeness of creation. “The plastics challenge is helping us refocus on Christ and on caring for the earth and for our own space,” she noted. Kerri Clark, pastor of Trinity Lutheran Church in Connellsville, Pa., said her congregation recently used 70 glass cups for Communion wine rather than the plastic cups they typically use. The congregation also replaced the plastic plates and utensils for a Shrove Tuesday pancake dinner with reusable plates and flatware. Following services, Trinity distributed reusable bags emblazoned with the church’s name and the Luther Rose so that members might use them for food pantry donations. “That time spent washing reusable items has the potential to be a time for people to connect with one another,” said Michael Robinson, pastor of St. John’s. He agrees that the challenge requires people to be more intentional in their everyday lives. As part of the challenge, the 700-member church is using paper cups and getting away from buying plastics in bulk.